All rights reserved. Do not redistribute, claim, copy, edit or use it in any way without my written permission. It was amazing to push up my abilities and make something better and better!! As always I remember that COMMISSIONS ARE OPEN! Don't be shy, take a look u'll not be disappointed! Thank you so much! I've painted it myself so I am soooo happy you think so!! Awesome looking meshmods! Am I guessing these are not public models? That's fine if they aren't. I'm just curious. The picture looks great! Oh, sorry! That's what I get for not paying close attention to the description. lol I think my brain wasn't on 100%. I had only been awake for about 20 minutes this morning when I checked my Deviation feed. Well, like I said, it looks great! LOL no worry don't be sorry. I understand I do my checks in late night or mornings as well! That's okay darling! You're very talented. There will always be something new to learn. The day you stop learning is the day you give up. Very nice! 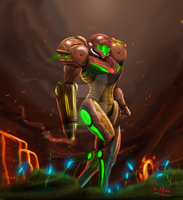 Love the Samus character! Thank u glad u enjoyed! oh my GOD! Samus is my favorite! Glad u liked it it's awesome to see how u enjoyed!